As always, I want to thank you for coming back again and again to read this little blog. I had no idea when I started this blog a few months ago that I would have so many people coming back to read! Thank you for taking the time to stop by and hopefully you have been inspired to do a little something crafty to your own home! I might just have to keep this one for myself! My sister made Kate a bow hanger when she was still a baby. 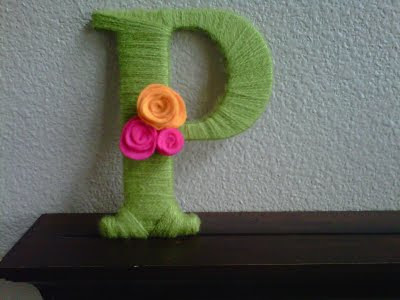 She made it out of a cheap frame, a small letter, and some ribbon. I love it because it was homemade by my sis and it is super functional. Kate's baby room had a lot of pink and green, which were the colors of the bow hanger. I thought I had a before shot (bad blogger), but I can't find it. 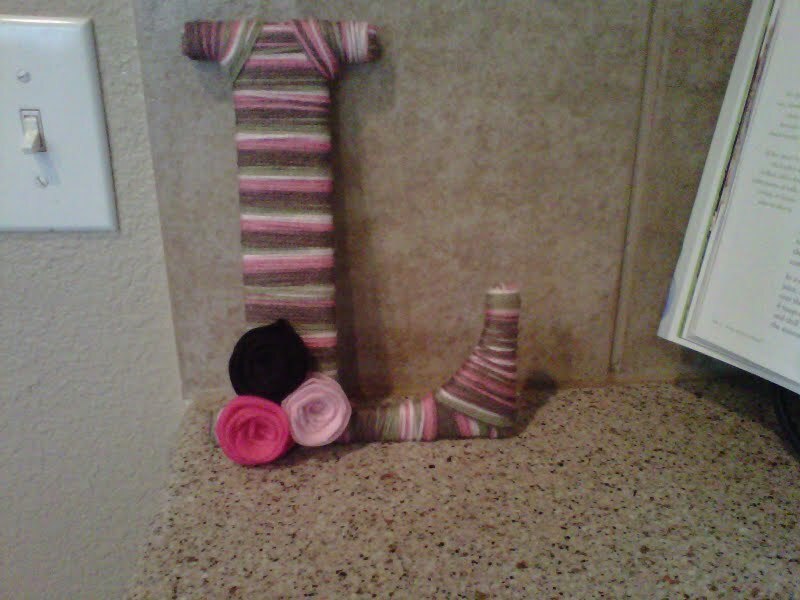 Here is a pic of my niece's bow hanger (hence the "M"), and Kate's is similar (Mia just has way more bows)! I am currently changing out a few things in Kate's room as we get geared up to transition her to a big girl bed. She has PINK walls, but I am taking most of the green out of her room and I needed to change up the bow hanger a bit. First I ripped off the old green grosgrain ribbon and attached some new polka dot ribbon (left over from another project in her room). Next, I removed the gingham fabric from the glass part of the frame and added a small piece of burlap that I already had in my stash.﻿ I also painted the white frame a light blue/grey (the same color that I used on her new recovered chair). I decided to post a little tip on spackling those pesky holes in your walls. I actually heard the tip on the Nake Berkus show several months back, and recently used the tip as I am currently tackling my guest bedroom/work space. 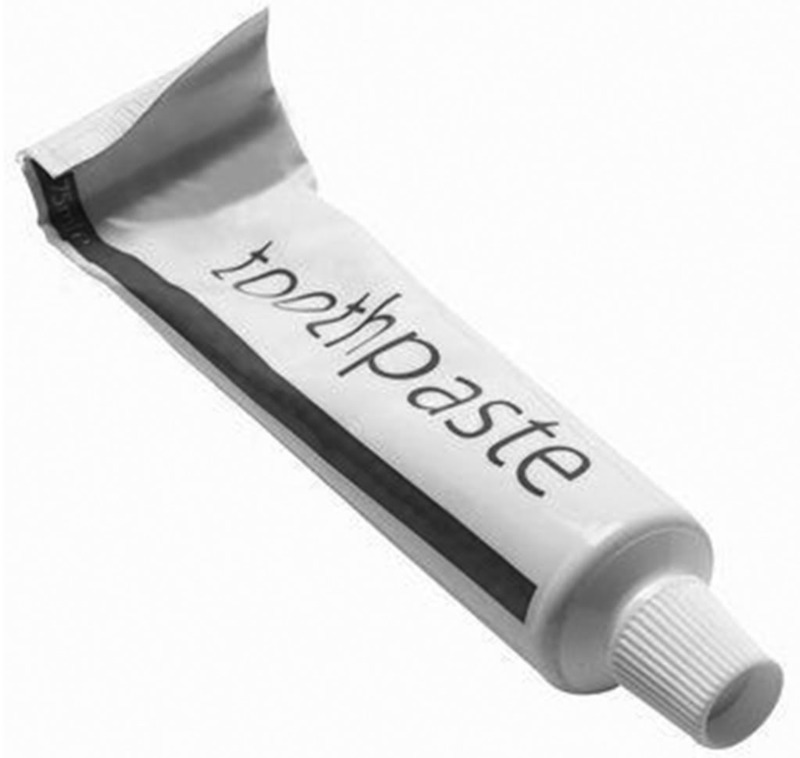 Tip: In case you don't have any spackle on hand or you don't want to purchase any, use toothpaste to fill your holes. Yes, I have used this tip several times and it works! I have so many little travel tubes of paste that I keep in the tool box, and they have come in handy! The tip also kind of ties into the season premier of the Bachelorette, which was last night. The Bachelorette is a dentist, so very fitting, don't ya think?? Did you watch?? I am a sucker for the show. Call me a cheeseball, and I never expect the final couple to last, but it is still fun to lose yourself in the show! I found two faux bamboo frames (11 x 14) at the Habitat Home Store a few months back. They were marked $5 each, but the manager was at the counter when my friend and I checked out, and he said I could have them for a buck each! Remember, everything is negotiable! I recently bought a large cabinet door frame to turn into a jewelry holder (to sell). The price was $10, and I asked the cashier if she would take $5 for it, and she immediately said yes. It pays to ask! I tried looking for large prints to put in the frames, but came up empty handed. They are large frames and they were hollow, so I decided to go ahead and frame pieces of fabric. Because the frames were hollow, I need something to adhere my fabric to. I happened to have a diaper box in my recycling (K still wears one at night), and starting cutting away. The fabrics are from Hob Lob. I can't recall the price, but I used a 40% off coupon on the more expensive one. I did not need a lot of fabric, so this project was super inexpensive! Once the fabric was wrapped, I centered the cardboard on the frame and staple gunned it to the frame. I then added my own hanging mechanism to the back of each one. These were so easy to attach to the frame (Home Depot). I love the way the two fabric choices compliment each other and add a pop of color. I bought this storage piece at Homegoods when we first moved in to this house. I don't have any sort of desk space in my kitchen, so I wanted to place for loose papers, notebooks, etc. It is simple and basic, but cute enough. It was my hubby's birthday yesterday. It begins the time of year (for 6 months) that he is 32 and I am still 31! Why doesn't age affect men? He could care less about getting older and all I can think about is how I don't get carded anymore, how I should have thought twice about going to the tanning bed when I was younger, and where did all these grays come from???!!!! My in-laws were here visiting, so we decided to grill out and I made some homemade oreo cupcakes to celebrate. I knew I wanted to try these after seeing the recipe over at http://thelarsonlingo.blogspot.com/. She actually hosted a "Cupcake Carnival" where you can find several other delicious cupcake recipes! I love her sweet little blog. 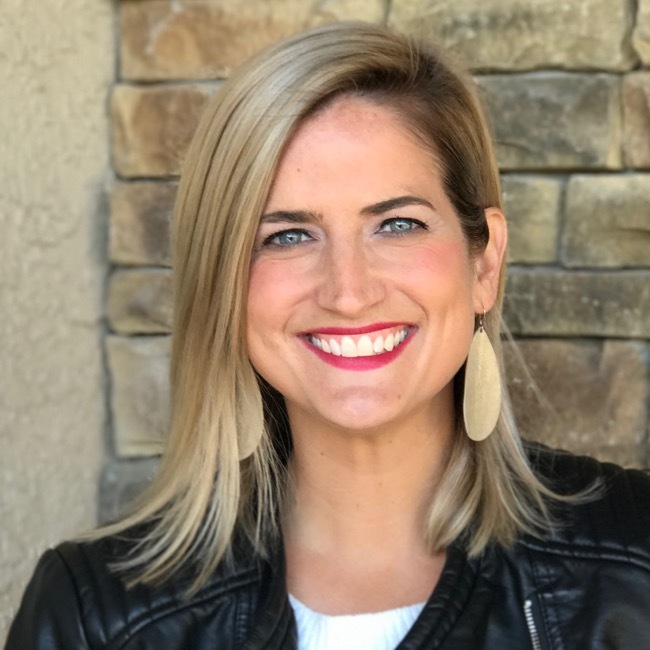 I found out about her blog after she was drawn to the "Larson" part of my blog...we share the same last name and we both have a daughter named Kate! I think we were meant to be blog friends!! You can get the full recipe here. You must try these. Delicious, simple, and fancy looking! Yes! The first step is to put an oreo on the bottom of your cupcake liner. How can you go wrong here? Homemade icing is just so much better than store bought (as with most things). Most of the projects I complete for my home come from ideas in blogland. Believe it or not, I don't read that many blogs, but I do love to poke around and find new ideas. I found this guest post from Mama Says Sew via Tatertots and Jello. I will always give credit where credit is due!! You can find the original post and additional tutorial here. I can't remember exactly how many yards of fabric I used, because I know I had to go back to Hob Lob to get more at one point (you will just have to eyeball). I covered the entire lampshade with burlap. I had absolutely no idea what I was doing with this, but I managed to get it looking pretty good. A little hot glue and tugging and pulling and you will get it right too! Pretty on the outside, but not so cute on the inside! I trimmed back what I could, but you can't see it, so don't worry about it! I then started cutting burlap strips. Lots of them. This small lamp shade required a lot of strips. Then I hot glued the edge of the strip and formed them to look like this. Keep gluing and adding more strips to fill in the space. After several hot glue burns and some patience, I completed it! I love the finished product, but this one did take a little more time. It was inexpensive and I love the touch of burlap that is so in right now. This will be taking up residence in Kate's "big girl" room that I am currently working on transforming. She has bright pink walls, and I am trying to add some "earthy" elements to tone it down a bit! More pics to come of her room soon! What else have you done with burlap-I WANT more!! My sister first turned me on to spreadable cheese a while back. I prefer the garlic and herb flavor that you can get at any grocery store near the brie, mascapone section. You can spread it on crackers, dip veggies in it, spread it on a sandwich, the possibilities are endless! I always have some in my fridge. My sister suggested spreading it on the bun of a porkchop or pork tendeloin sandwich. My hubby grilled out for us recently and I tried this, and it was EXCELLENT! I also spread it on french bread and top with parmesan cheese. Put in under the broiler for 3-4 minutes, and you have a delicious "garlic bread"! It is really the only way I do garlic bread anymore. I have also been obsessed with McCormick's Grill Seasoning for some time. I put this on everything, including those porkchops we had the other night. I drizzle a little extra virgin olive oil and sprinkle it on chicken, steak, vegetables and whatever else I can find! Because I have a brown brick house, and the chair is brown, I needed something with a pop of color that took up a lot of space on the chair. My mom and I found this flower basket at Home Depot for a good price ($12, I think). I added a little burlap bow to one of the legs for a touch of sweetness! I decided to just move the white distressed chair to one of my front flower beds for a bit of height and interest. I tied a burlap bow, added a geranium, and a little bird to finish it off. Not quite sure what the old chair obsession is, but I love the instant charm and how they look from the street!